The commissioner is the liaison between the local council and Scouting units. The commissioner’s mission is to keep units operating at maximum efficiency, maintain regular contact with unit leaders, coach leaders on where to find assistance, note weaknesses in programs, and suggest remedies. The commissioner is successful when units effectively deliver the ideals of Scouting to their members. 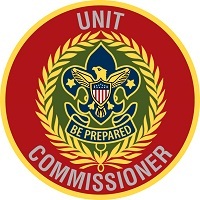 If you would like to volunteer and serve as a Unit Commissioner, please contact your District Commissioner. Help each unit earn the Bronze, Silver or Gold Level in Journey to Excellence. Use the annual commissioner service plan, with its scheduled opportunities for commissioner contact with units. Know each phase of Scouting and its literature. Be able to describe how each works. Visit meetings of assigned packs/troops/teams/crews regularly, usually once a month. Visit regularly with the unit leader. Be aware of unit leader concerns and challenges. Serve as the unit leader’s coach and counselor. Build a strong, friendly relationship. Using the literature and profile sheet, help the leader see opportunities for improvement. Encourage unit participation in district and council events. Work to ensure effective unit committees. Observe the committee, offer suggestions for improvement, and work to solve problems. See that unit leaders and den leaders have adequate training.